Here’s what’s up in the world of TV for Sunday, October 16. All times are Eastern. 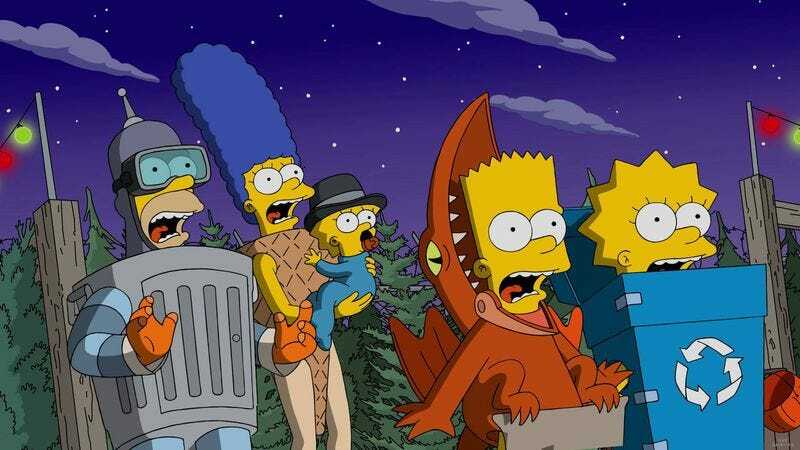 The Simpsons (Fox, 8 p.m.): Here’s something scary for you: The Simpsons has now been on the air for six hundred episodes. Wow, it’s sure come a long way since an old drunk made humans out of his rabbit characters in order to pay off his gambling debts. Fittingly, The Simpsons gets to mark its august occasion with the latest installment of its beloved Treehouse Of Horror series. Last year’s terrifying triptych saw Sideshow Bob finally kill his old archenemy (or rather his second old archenemy after rakes), and this year features the return of Frank Grimes (or Grimey, as he liked to be called). Remember Frank Grimes? Now he’s back, in ghost form! Also: there’s a virtual reality opening called “Planet Of The Couches,” Lisa gets a homicidal imaginary friend, Mr. Burns stages his own personal Hunger Games, and Bart goes from crank calling Moe to joining his group of “secret barfly agents.” Dennis Perkins always wanted to become a secret barfly agent, ever since he was a child and wore an onion on his belt, which was the style at the time. But the Berlin setting doesn’t just inform the series’ treatment of international quagmires and sensitivity to scandals. The long history and high visibility of Berlin’s LGBT community also provides a metaphor for all the secrecy of espionage. It’s kind of an obvious choice, but that concept of double lives does indeed apply across the board, and it also reflects a deeper understanding of the area. The Durrells In Corfu (PBS, 8 p.m.): Between this and Poldark, PBS is killing it with shows that are fun to say. This new series, adapted from the book My Family And Other Animals, features Upstairs Downstairs’ Keeley Hawes as an English widow in 1935 who takes her family to the Greek island of Corfu and its “endless opportunity for living, loving, shooting, and animal collecting.” That sounds like it’ll go great on the brochure, right next to that whole Ottoman invasion thing. Killing Reagan (National Geographic, 8 p.m.): Not, as you might suspect, a dramatization of what endorsing the blowhard to end all blowhards has done to the Republican party. Instead it’s an adaptation of Killing Reagan, the book by runner-up blowhard to end all blowhards Bill O’Reilly on the attempted assassination of Ronald Reagan, with Tim Matheson as the president and Cynthia Nixon as his wife Nancy. Nixon spoke with The A.V. Club about playing the first lady, a chat that led us down a rabbit hole of game show discussion. Rob & Chyna (E!, 9 p.m.): It’s the first season finale of Rob & Chyna, meaning our Sisyphean task of keeping up with the Kardashians gets a little easier after tonight. Eyewitness (USA, 10 p.m.): Our nation’s hunger to watch European dramas without all those pesky foreign languages continues with this adaptation of the Norwegian series Øyevitne. According to Alex McCown-Levy, it’s “the definition of a satisfying middlebrow mystery drama,” but the ever-welcome presence of Julianne Nicholson lifts it past mediocrity. Fifteen more days to Halloween, Halloween, Halloween! Fifteen more days to Halloween, Silver Shamrock!